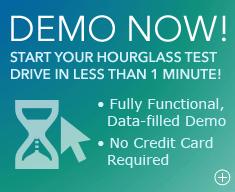 HourGlass improves your productivity and profitability while providing your clients with transparency and accountability for all of your work and your billings. 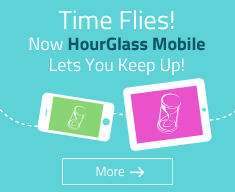 HourGlass helps you bill and get paid faster! HourGlass was built using leading edge technology to provide you with best in class performance. Security, simplicity and speed are the cornerstones of the design philosophy behind HourGlass. In doing so, we have created a service that is exceptionally intuitive, efficient and powerful. The design of HourGlass is brilliantly simple to keep it intuitive and user-friendly. Even advanced functions remain easy to use, increasing employee compliance and keeping you on track and on budget. 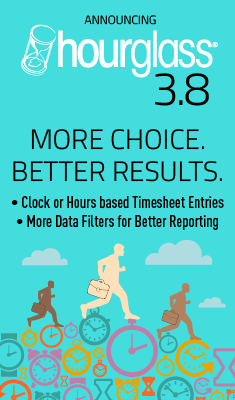 Manage multiple office locations and multiple levels of administration comfortably: as granular or as big a picture as you need from your reports. Mobile compatible! Review assigned tasks, track time and expenses on-the-go from an intuitive mobile optimized interface. HTC manages all our own projects using HourGlass, so the security of the platform is our highest priority. HourGlass runs with 256-bit SSL encryption, keeping your data protected every step of the way. Information is stored at our datacenter, where we have backup power, backup air-conditioning, RAID storage and nightly backups to make sure you never lose your data. The platform allows a customized level of access according to your corporate hierarchy- HourGlass adapts to your information flow, giving your administrators the same level of control online as they have in their own office. HourGlass is designed for fast page loads; the interface is light on graphics to let it hold vast amounts of information while maintaining the immediacy of load times. Our database is optimized to maximize performance speed to keep your information traveling at the speed of our Broadband world.